This will be the second Earth Fare grocery store in Pinellas County. 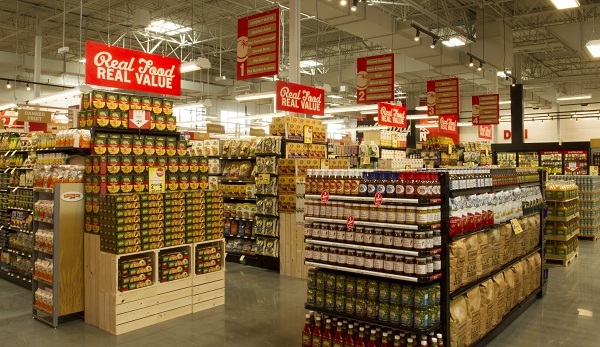 OLDSMAR – Earth Fare, a natural and organic food retailer, is scheduled to open Wednesday (Oct. 18) in Oldsmar. Founded in 1975 in Asheville, North Carolina, Earth Fare is one of the largest natural and organic food retailers in the country, with more than 42 locations across 9 states in the Southeast, mid-Atlantic and Midwest. A ribbon-cutting ceremony is scheduled for 6:45 a.m. There will be live music, free coffee, samples and gift cards for the first 100 shoppers. The store will be open from 7 a.m. to 11 p.m. seven days a week. The 24,000-square-foot store is at 3136 Tampa Road, adjacent to Beall’s, in the Woodlands Square shopping center. This will be the second Tampa-area location for Earth Fare, which opened a location in Seminole in September 2016, and also has locations in Gainesville, Tallahassee, Ocala, and Jacksonville. Earth Fare made headlines earlier this year when they challenged Americans to take back control of their health through their food choices and Live Longer With Earth Fare ™. Since 1975, Earth Fare has distinguished itself as a leader in the health foods industry by developing a unique food philosophy that informs every product offered in the store. This food philosophy ensures that all products sold are free of high fructose corn syrup, artificial fats and trans-fats, artificial colors, artificial preservatives, artificial sweeteners, bleached or bromated flour, and are never administered antibiotics or growth hormones. In addition, Earth Fare just announced that its more than 500 private brand food products are now sourced using only non-GMO ingredients, and new products are added to the shelves each day. Beyond groceries, the new store will also feature Earth Fare’s Heirloom Organic Juice Bar, which features 100 percent certified organic coffees, smoothies, and juices, including custom blends as well as convenient freshly prepared bottles for the person on-the-go. Shoppers will also find a wide variety of organic choices at Earth Fare’s kitchen, featuring fresh ready-to-go meal solutions including salad bar, hot foods bar, pizza station, sandwich counter, and conveniently packaged meals-on-the-go. Shoppers can enjoy a homemade meal without the work, whether dining in the indoor and outdoor 80-seat café with free Wi-Fi or in the comfort of their own home. For information about Earth Fare go to earthfare.com.